Millions of people in the path of Florence are hunkering down Friday as the monster storm pummels North and South Carolina, bringing catastrophic inundations and forceful, destructive winds. Here are snapshots of people struggling to cope with the slow-grinding storm. As Glorious Elting stood on her front porch Thursday, it suddenly got very dark and the wind started howling. It hadn’t occurred to her until then how much danger she might be in. She’s seven months pregnant and moved alone to Lumberton, North Carolina, from Poughkeepsie, New York, less than two weeks ago. She’s never been through a hurricane and has nowhere else to go. She said Friday that she called her sister and told her she was scared to death. She asked her to pray for her, and to tell her mother she’s sorry if she dies. She now lives in South Lumberton, a neighborhood devastated by flooding after Hurricane Matthew in 2016. Many of the homes around her have remained boarded up and vacant ever since. She wept all day and spent Friday afternoon on her couch, reading her Quran and praying. She has supplies and a friend, Denise Hunt, came to stay with her. She is mostly worried the stress will cause her to go into premature labor, and if she does, whether authorities will be available in the storm to come to take her to the hospital. He was a lonely figure, first a tiny dot of light as he used a small flashlight to scan the water’s edge, then widening his search as a gray, overcast dawn broke. The persistent rain hadn’t started yet in Myrtle Beach at sunrise. But the winds started to howl and gust, rising above 30 mph (48 kph), according to the weather station at the airport. “I came over the dune, and I was like, ‘I can’t even hear the ocean,'” Lewis said. Forecasters warn the weather will go downhill all day in Myrtle Beach as Florence moves onshore Friday. Conditions may not improve until well into Saturday depending on the system’s track and how much strength it can keep after landfall. Inland, forecasters warned of 20 inches of rain or more that could cause major, catastrophic flooding. “Donut Man” Joseph Santos might run the only place to eat that is open on Myrtle Beach as Hurricane Florence approaches. “I see the first responders. They put their lives on the line every day of the year. I can stay open for them,” Santos said, taking a brief break from the kitchen as his wife of 47 years, Maria, worked the cash register. Santos moved to Myrtle Beach from Massachusetts 14 years ago. He bought an old bank and turned it into a restaurant. That wasn’t a deliberate decision, but the sturdy building and vault in the back help him stay open no matter the weather. They got quite a boost from Hurricane Florence’s winds. This eastern North Carolina city is located about 120 miles (193 kilometers) north of Wrightsville Beach, where Florence made landfall as a Category 1 hurricane Friday morning, and was receiving fierce winds and heavy rain from one of the storm’s bands. Tim White – a 64-year-old electrician, lifelong resident of the city and self-proclaimed friend of Simpson, the late artist who created the contraptions out of salvaged metal – walked through the park Friday afternoon to watch the whirligigs spin with his wife. He said Simpson and his son spent “all their spare time” assembling the dozens of mechanisms for the park before his death in 2013. Two years ago, during Hurricane Matthew, water poured from it and inundated the neighborhood. His neighbors had to be rescued from their houses. Most evacuated this time. But Manney just moved in a month ago and thought he’d be able to wait it out. “I don’t know anymore, I’m starting to get concerned,” he said. That storm devastated the city, and many neighborhoods have not recovered. The elementary school behind Manney’s home was rendered a total loss in the flood and permanently closed. He watched the downpour from his porch where he marked how high he’s been told the floodwaters rose, about a foot from the floor. “If it keeps on like this, I’m getting out of here,” he said. But most businesses in the home of the region’s primary medical center were closed, some protected by plywood over the windows and with sandbags around the base of doorways. “Bored and stuck in the house. There’s only so much to do,” Weathers sad. “I love a good storm. I haven’t left for any of them over the years,” he said. Wareheim said he lost power early Friday. He bought a generator earlier this week, but at the moment, it wasn’t very helpful. Wareheim said so far the wind has only knocked down branches and limbs small enough to be carried. “Nothing you need to get a chain saw after yet,” he said by phone. 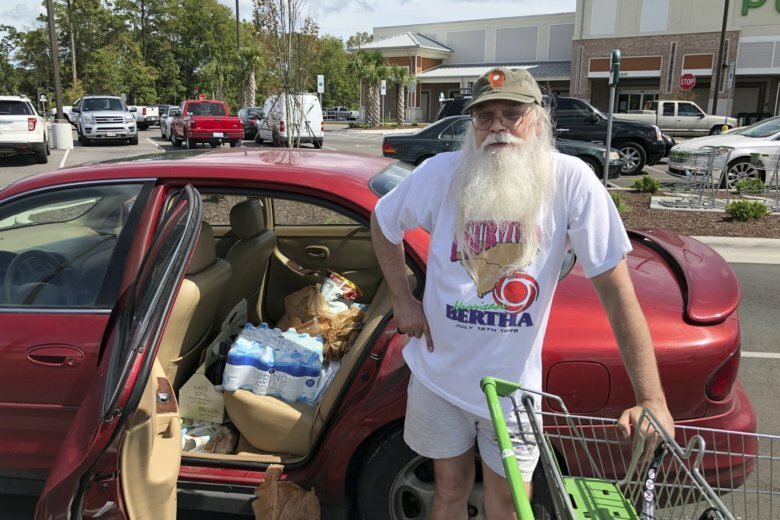 Griffin said she was jolted awake when the power went off at the hotel as some of the storm’s strongest bands lashed Wilmington with wind and rain. As she sat in the hotel lobby eating a cold breakfast of bananas, cereal bars, and pastries, she recalled that the decision to heed the mandatory evacuation order for her area wasn’t difficult. “If you are over there and something bad happens, you’re out of luck,” she said. She wasn’t as lucky when a property she owns in Florida was heavily damaged by Hurricane Irma last year.